If you have pain from Tendonitis, should you take Anti-Inflammatory drugs or pain killers? Either way, the problem with anti-inflammatories and pain killers is that they will neither reduce Tendonitis itself, nor keep it from getting worse, nor make it all better. So while anti-inflammatory drugs like ibuprofen may be fine to get you through the day, in no way, shape, or form, are they a 'fix' for tendonitis. Not only do they not help fix or cure an injury, they can in fact slow the healing process. If you want to educate yourself more on this topic, keep reading. If you want to jump right to something that will make an immediate difference, find out How To Reduce Inflammation. One of the main problems with Tendonitis is Inflammation. When the body is injured or thinks that it is injured, it kicks in an Inflammation Response. Inflammation consists of two main components. 1. Traps fluid in the area. 2. Releases chemical that increases your sensitivity to pain. Clever humans that we are, we generally do our best to ignore the pain and keep on doing the activity which is causing the pain. Why? Usually it is because of a job where you have to keep performing that repetitive motion, or because of an activity that you love, like knitting or sewing or playing a sport. When things get 'bad' we'll go see a doctor and she might prescribe Corticosteroid Injections. But before things get bad enough for a trip to the doctor, we look for ways to reduce the pain, like taking some (non-steroid) Anti-inflammatory Medicine. Anti-inflamatory medications like Ibuprofen and Advil and Aspirin are supposed to reduce the Inflammation Response, thereby lowering the level of pain. To the degree that they help, they do. When you are in pain, anything that might help starts looking like it's worth a try. I've had a fender bender and neck pain before, and I'm physically active. I have no problem taking Ibpuprofen from time to time. Pain is no fun, and I'd just as soon not suffer any. Which is fine for something that's only going to hurt for a day or three anyway. But anti-inflammatories are not a cure all. It is my experience both personally and professionally that anti-inflammatory medications are good for little 'tweaks' and minor issues that are going to go away in a day or two anyway, but are not at all effective for issues like Tendonitis and Carpal Tunnel Syndrome. As I said, I've had many little one day aches, pains, and injuries, and I pop some Ibuprofen and I'm all good the next day. But for a chronic pain or something that's been hurting or is going to hurt for a long time? No way. I'd rather fix the problem than numb myself to it. I've tried Ibuprofen, and lots of it, for various injuries. It's helped in the moment, but not in the long term. after a 4 week perioed than the patients that were given a placebo. Make Sure You Understand Tendonitis! See What Is Tendonitis? to fully understand the process that is causing your pain. Here's the thing. Even if anti-inflammatory drugs do 'help' lessen pain, they don't fix or cure the Tendonitis injury dynamic. The 'help' that they can provide is to temporarily lessen the inflammation response, thus decreasing pain. That is a plus. The problem is, is that as soon as the pills wear off, Inflammation jumps right back into the game. If Anti inflammatory medicine works for you, definitely consider it a short-term tool to help diminish your pain. But only for short term use. It is not the best of ideas to take Anti-inflammatory drugs over the long haul. Various detrimental side effects show up from long term use of medications like Advil and Ibuprofen. Besides anti-inflammatory side-effects, the real problem with Tendonitis and Inflammation is that reducing Inflammation DOES NOT make the Tendonitis 'better'. The structure is not fixed to any degree just because your pain diminishes. But there are some drawbacks and downsides to that. Irritation of the lining of the gut which can result in Leaky Gut, ulcers, bleeding, or holes in the stomach or intesting. What?? Decreased muscular and tendon pair and reduced tendon strength?? And doctors prescribe this medication, telling you it 'will' or 'should' help? Yes, yes they do. Every day. To millions and millions of people. A study was done on Ibuprofen and tendon injuries in animals. The only thing the ibuprofen doses resulted in was DECREASED TENDON STRENGTH! A 300% decrease at the four week mark! Definition: tenorrhaphy. Tenorrhaphy is defined as: The surgical suture of the divided ends of a tendon. Also called tendinosuture, tenosuture. The main source of off-the-shelf pain killers consist of Acetaminophen. 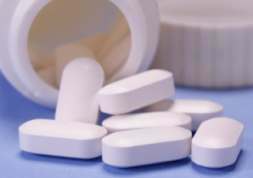 A potential problem is, even very low doses of Acetaminophen can cause (and have caused) liver damage. There are documented cases of people taking one dose of Acetaminophen and getting liver damage. Oops. Then you bump up to Prescription Strength painkillers, consisting almost totally of Narcotics. Vicoden, Percocet, Darvocet, my favorite, Dilaudid, and many others. If you've been taking these for any length of time for Tendonitis or Carpal Tunnel, I urge you to consider that you are WAY down the wrong path. Don't get me wrong. Pain is, well, pain, and I've been known to pop a pill if and when injuries get painful past a certain level. Take them for a day or two, sure. Any longer than that just means that you don't yet know any better option to get out of pain. I bet that you, like me, want not only your pain but your 'problem' to go away. Anti-inflammatory Drug or Pain Killers aren't going to do it, even if they are prescription level strength as opposed to over-the-counter. Let's say that Anti-Inflammatory medication and/or Pain Killers DID make all your pain go away. Maybe you wouldn't feel any pain, but you would be left with one giant downside. The downside of 'pain relief' is that if you feel better but your structure is not healed, you will keep doing the harmful activity and will be having pain again soon. Only worse than it was before. For some reason we like to pretend that if our pain is gone, then we are injury-free. That's ABSOLUTELY not the way it works. Click on the link to read an educational story of a time I had a severe thumb injury and how I quickly and successfully eliminated the Inflammation without Anti-Inflammatory Medicine. There are methods that actually do kick out the inflammation process, noticeably and quickly. And if there are more effective methods, why use a product like Ibuprofen that can't cure you? To find out what you can do right now (FOR FREE) to quickly reduce your pain, discover How To Reduce Inflammation. Return to the top of this Anti-Inflammatory page. Go to the Process of Inflammation page.